Yellowstone rivers in Montana downstream to the Missouri-Mississippi confluence and the Mississippi River possibly from near Keokuk, Iowa downstream to New Orleans, Louisiana (Coker 1929; Bailey and Cross 1954; Brown 1955; Carlson and Pflieger 1981; Kallemeyn 1983; Keenlyne 1989 and 1995). Pallid sturgeon also were documented in the lower reaches of some of the larger tributaries to the Missouri, Mississippi, and Yellowstone rivers including the Tongue, Milk, Niobrara, Platte, Kansas, Big Sioux, St. Francis, and Grand rivers (Bailey and Cross 1954; Brown 1955; Keenlyne 1989; Snook et al. 2002; Braaten and Fuller 2005; Peters and Parham 2008). The total length of the pallid sturgeon range historically was about 5,656 River kilometers (Rkm) (3,515 River miles (Rmi). Because the pallid sturgeon was not recognized as a species until 1905, little detailed information is available concerning early abundance. Forbes and Richardson (1905) suggested that the lack of prior recognition of the species might have been attributable to scarcity, noting that pallid sturgeon accounted for about one in five hundred individuals of the Scaphirhynchus sturgeon collected from the central Mississippi River. The species was reported to be more abundant in the lower Missouri River where some fishermen reported one in five sturgeon as pallid sturgeon (Forbes and Richardson 1905). However, it is probable that commercial fishermen failed to accurately distinguish the species in their sturgeon catches. As late as the mid-1900s, it was common for pallid sturgeon to be included in commercial catch records as either shovelnose or lake sturgeon (Keenlyne 1995). Correspondence and notes of researchers suggest that pallid sturgeon were often encountered in portions of the Missouri River as late as the 1960s (Keenlyne 1989). While there are fewer than 40 historical (pre-listing) records of pallid sturgeon from the Mississippi River (Kallemeyn 1983, Keenlyne 1989), this may be attributed to a lack of historical systematic fish collections from that portion of the range. Since listing in 1990, wild pallid sturgeon have been documented in the Missouri River between Fort Benton and the headwaters of Fort Peck Reservoir (A), Montana; downstream from Fort Peck Dam to the headwaters of Lake Sakakawea, North Dakota (B); downstream from Garrison Dam, North Dakota to the headwaters of Lake Oahe, South Dakota (C); from Oahe Dam downstream to within Lake Sharpe, South Dakota (D); between Fort Randall and Gavins Point Dams, South Dakota and Nebraska (E); downstream from Gavins Point Dam to St. Louis, Missouri (F); in the lower Yellowstone River, Montana and North Dakota (G); the lower Big Sioux River, South Dakota (H); the lower Platte River, Nebraska (I); the lower Niobrara River, Nebraska (J); and the lower Kansas River, Kansas (K). Pallid sturgeon observations and records have increased with sampling effort in the middle and lower Mississippi River. Additionally in 1991the species was identified in the Atchafalaya River, Louisiana (Reed and Ewing 1993) and in 2011 pallid sturgeon were documented entering the lower reaches of the Arkansas River (Kuntz in litt., 2012). Approximately 50 wild adult pallid sturgeon are estimated to exist in the Missouri River upstream of Fort Peck Reservoir (U.S. Fish and Wildlife Service (USFWS) 2007). 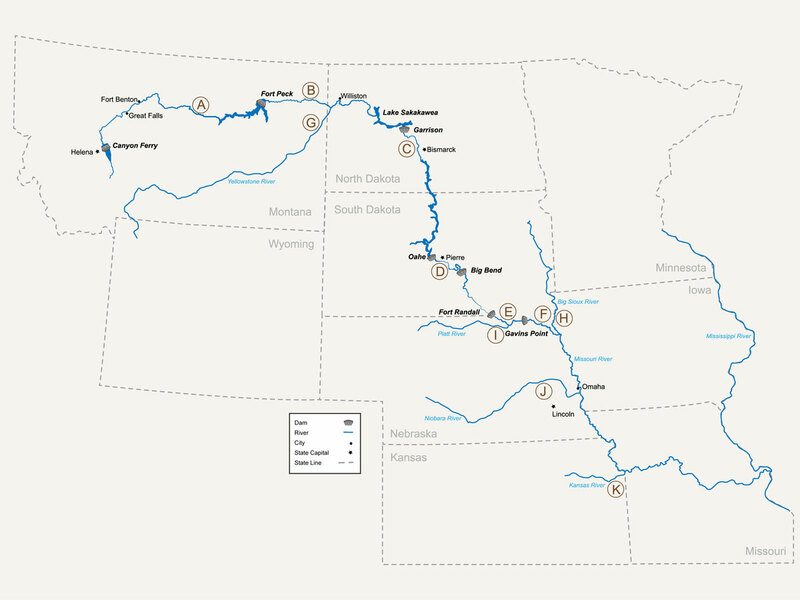 An estimated 125 wild pallid sturgeon remain in the Missouri downstream of Fort Peck Dam to the headwaters of Lake Sakakawea as well as the lower Yellowstone River (Jaeger et al., 2009). Current abundance estimates are lacking for the Missouri River between Gavins Point Dam and St. Louis, MO. Garvey et al. (2009) generated an estimate of 1600 to 4900 pallid sturgeon for the middle Mississippi River (i.e., mouth of the Missouri River Downstream to the Ohio River confluence). No estimates are available for the remainder of the Mississippi River. Since 1994, supplementation with hatchery-reared pallid sturgeon has occurred throughout the Missouri River and sporadically in the Mississippi River. Supplementation data are summarized in the stocking plan (USFWS 2008).